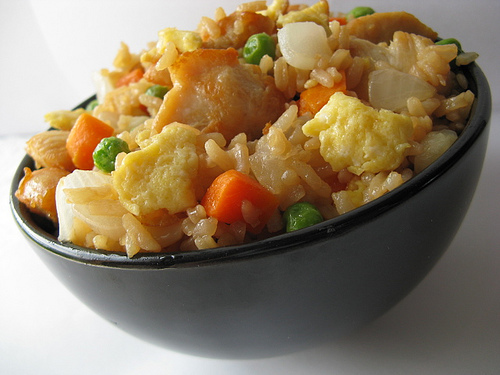 Chicken Fried Rice: Chicken fried rice is a popular dish at Chinese restaurants in many countries. It is an excellent recipe to make at home, because you can gather leftovers, such as cold rice, eggs, chicken pieces and frozen or fresh vegetables to make delectable chicken fried rice. This recipe is very similar to my egg fried rice recipe, except that we need to saute the chicken before adding it to the rice. Beat the eggs lightly, in a bowl using a spoon. Add a dash of salt. Chop the chicken meat and dice the onion and green onion. Heat a wok on medium heat. Add in the oil for stir fry. Pour 1/2 of the egg mixture into the wok, when the oil is ready. Cook the eggs over medium heat, turning over once. Cook the other half of the egg mixture the same way. Cut the cooked eggs into thin strips. Stir-fry the onions on high heat for a few moments. Stir-fry the green peas on high heat for a few moments. Add oil to the wok and, turn down the heat to medium. Add the soy sauce, salt, black pepper powder and oyster sauce as per the taste. Add the chicken, onion and green peas, egg stripes and combine thoroughly. Chicken fried rice is ready to be served. Serve chicken fried rice with chopped green onion as a garnish. If you have any queries regarding the Chicken Fried Rice recipe, please leave a comment.